And with that, Oregon is complete. 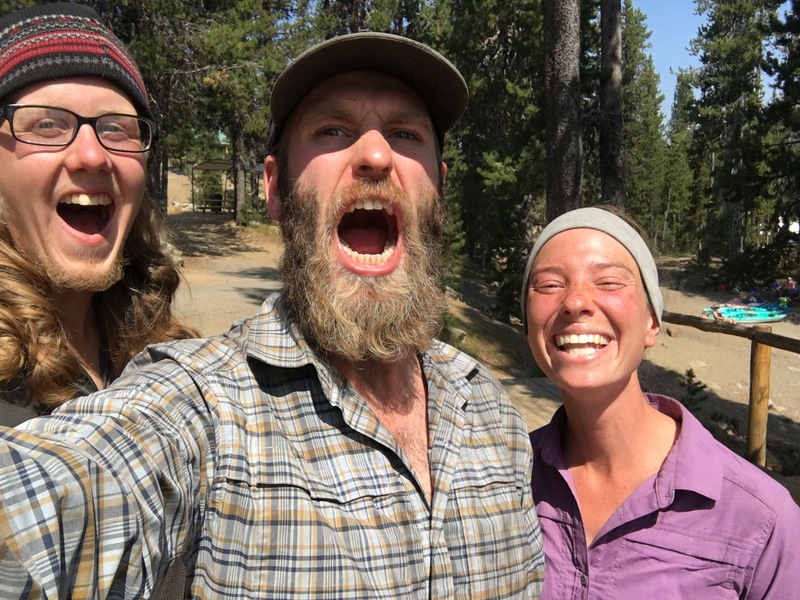 When we left the Sierras and set our sights on Oregon, it was with a bit of trepidation and anticipation in our bellies. 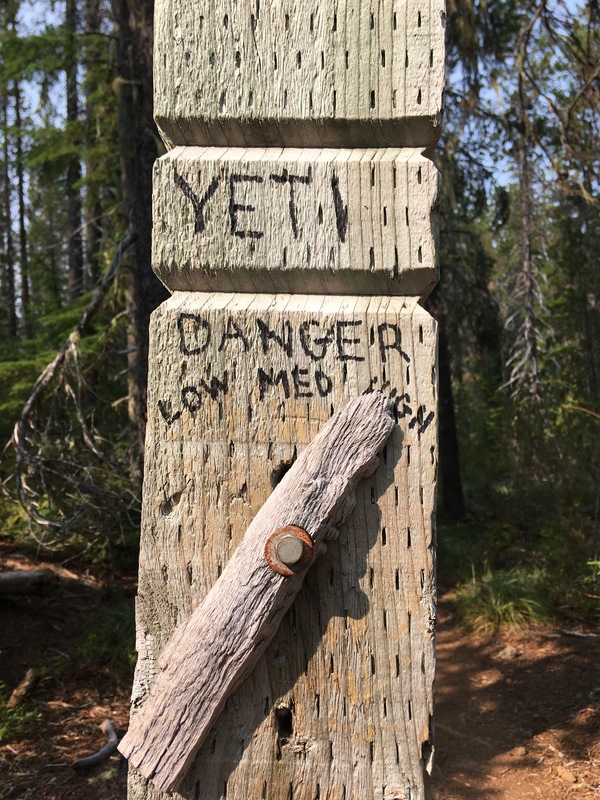 We had heard such conflicting reports from other hikers about their experiences in Oregon. While many seemed to agree that it was relatively flat, some lamented the mosquito ridden cesspools lining a trail blanketed in fallen trees. 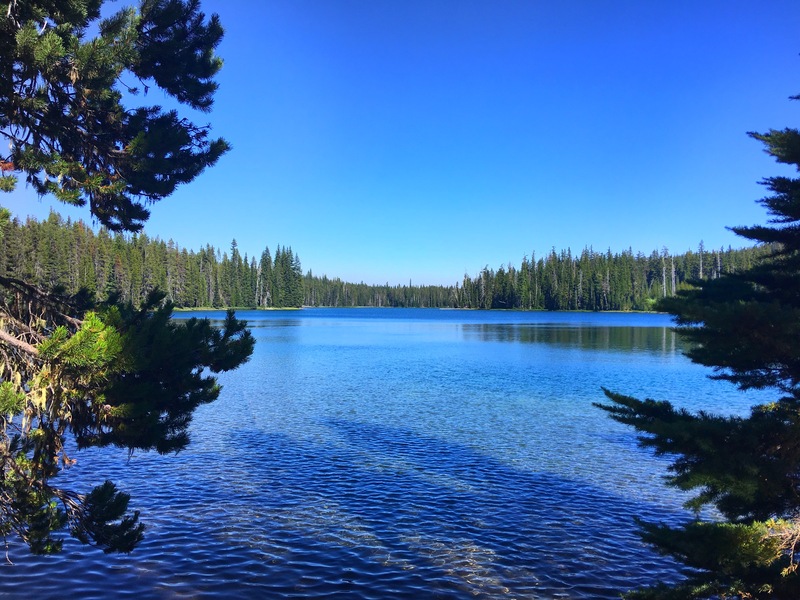 Others praised the state for the number of beautifully pristine lakes and mild temperatures while some complained of the lack of scenery and diversity along the trail. Each account offered vastly different tales of what was to come and, for the life of us, we couldn’t get a read on what to expect from Oregon. We’ve now sauntered through all of Oregon (minus a bit of fire closures) and our experience has been, for the most part, on the positive side. At one point, I even began referring to this section of trail as our “reward” for making it out of California. What’s made Oregon so great is really a number of things. For one, we’re finally back in a hiker bubble and have been reunited with some of our friends from the desert. We’ve loved hiking alone the past couple of weeks, but nothing can make up for the space a trail family fills out here. Laughter and conversation fill the night with a presence that the two of us simply couldn’t occupy alone. When we’re needing to push just a little harder at the end of the day, it’s our trail family that helps makes it a breeze. We’ve fallen in with a group of five others; Squarepants, Wilder and his dog Kiva, Comma, and Naked Ninja. 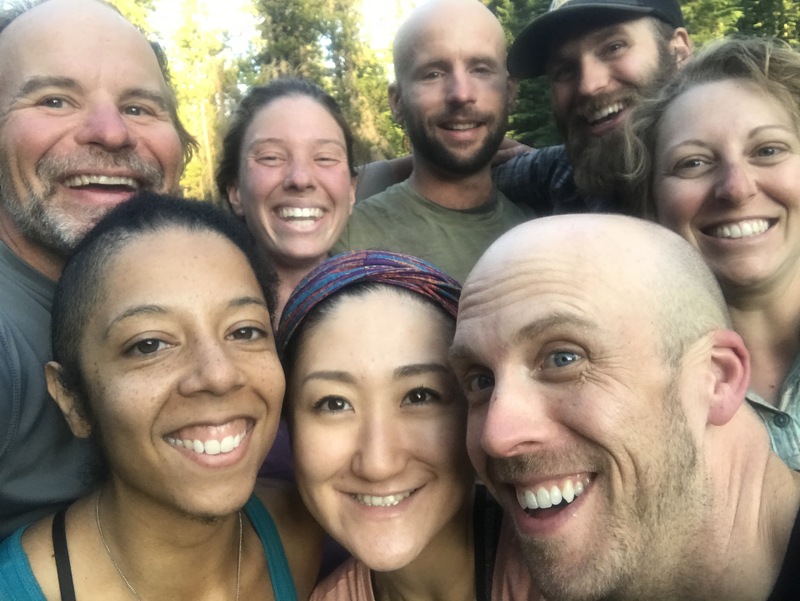 They’ve brought a level of motivation and excitement back into our experience, helping reignite the flame in us that initially made us fall in love with backpacking. Another positive to Oregon has been what I like to call the “resort tour”. Hiking is hard, I’m not going to lie. Realistically, I could walk all day everyday (and pretty much already do), but the mental strength it takes to overcome the monotony occasionally associated with this task is sometimes a bit too much. The occasional town stop makes a huge difference in breaking up the monotony. Real food, a shower, cold beer, internet… these are all things I didn’t think I would miss much while on this trek but now have a brand new appreciation for when in town. And that’s the beauty of Oregon! You can be in a town practically every 2-3 days. 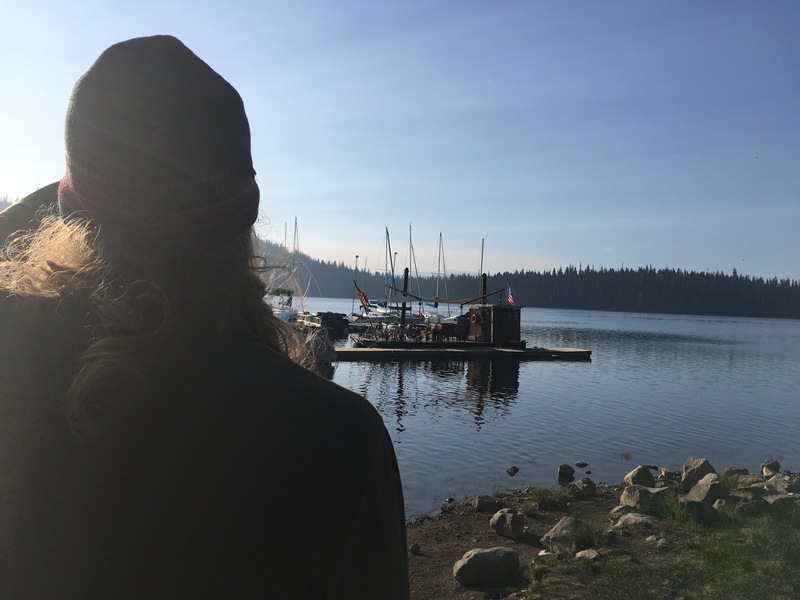 Ashland, Fish Lake, Elk Lake, Shelter Cove, Mazama Village, Bend, Ollalie Lake, Timberline, Cascade Locks… it’s never ending. I never had to go more that a couple of hours before having a craving satisfied. Oregon has been incredible in so many other ways, too. With only one slightly misty day, we’ve managed to stay mostly dry throughout our time in this typically moist state. 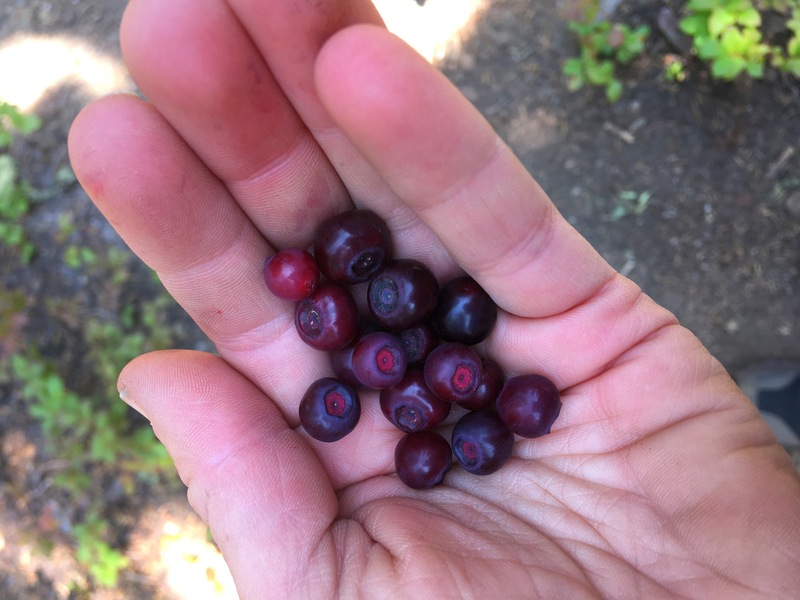 The huckleberries, blueberries, and blackberries have been perfectly ripe for the picking and lining the trail for as far as the eye can see. Hitchhiking around fire closures has been surprisingly easy, so much so that we even lucked out in getting a ride up this incredibly rocky forest service road with a couple also planning on camping where we were heading. We had our first experience of staying with a trail angel, a wonderful couple who loved good wine and beer and who helped us in so many ways while we tried to avoid the eclipse crowds and fire closures. We got to experience the eclipse in totality at what we deemed the “hiker party”. 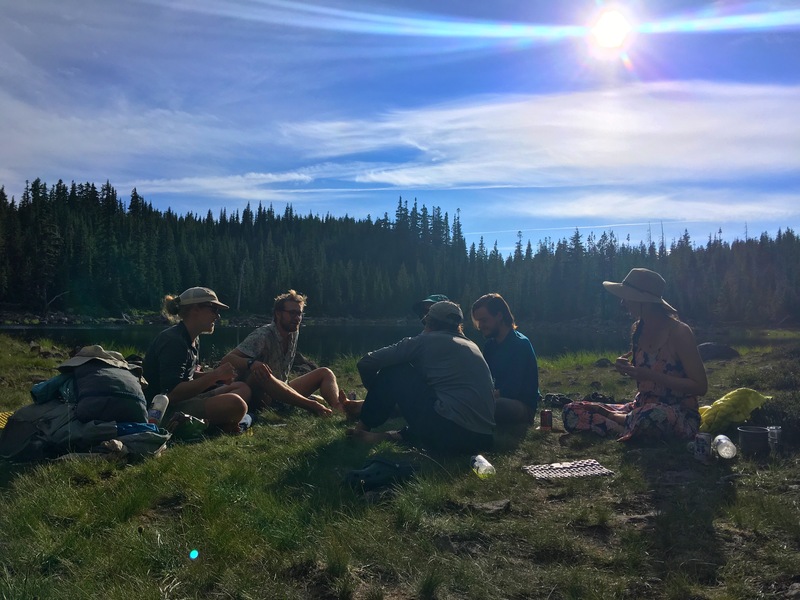 A group of about twenty of us all camped at a lake the night before, and then hiked a mile the next morning to a hill overlooking Mt. Jefferson. 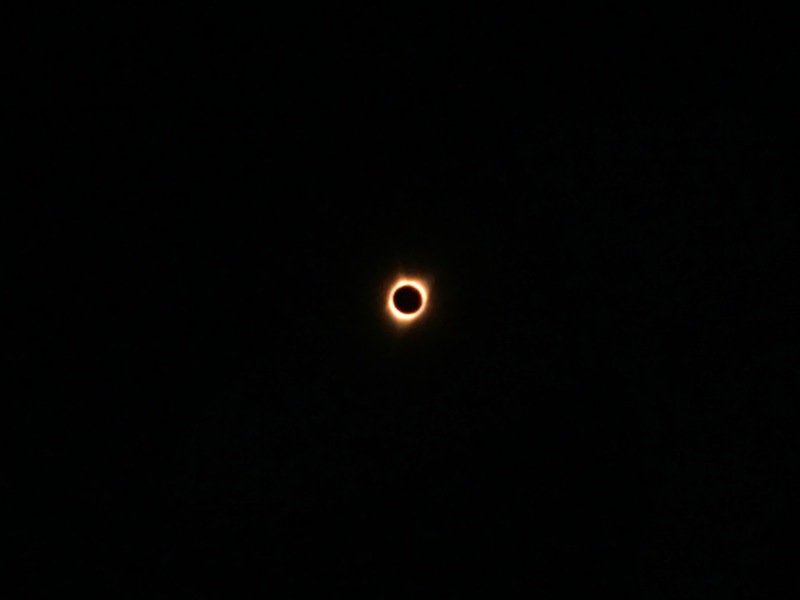 We had a great view for the eclipse, fantastic company, and we managed to avoid overbearingly large crowds trying to get a glimpse of the sun setting in the morning. I had the chance to teach a yoga class to a group of wonderfully supportive students, and at the start of shivasana we were able to look up to see a rainbow overhead. The mossy trees have continued to leave this magical element to the trail, creating this feeling that just cannot be explained. I could go on, but I think you get the point. 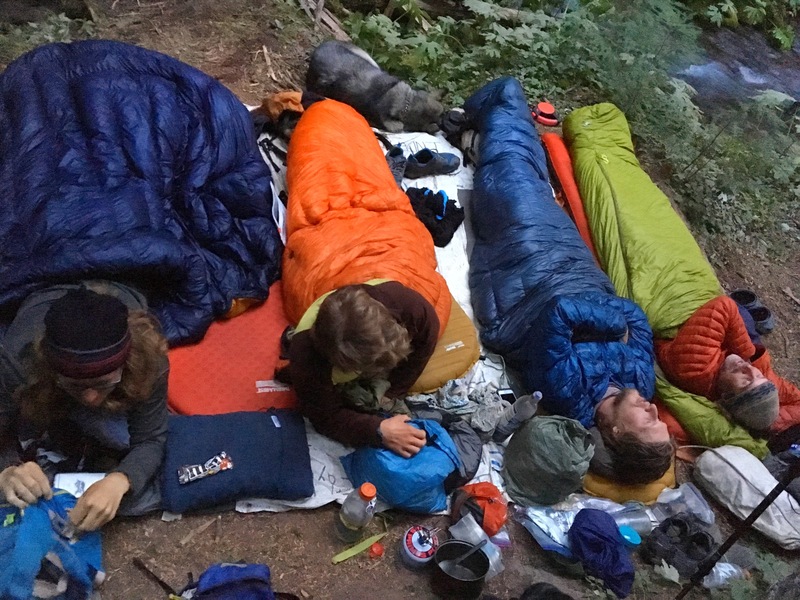 Oregon is, by our accounts, a fantastic part of the Pacific Crest Trail. As we approached the Bridge of the Gods today, there was a bit of emotion surging through me. With less than 500 miles to go, this journey feels like it’s so quickly coming to an end. 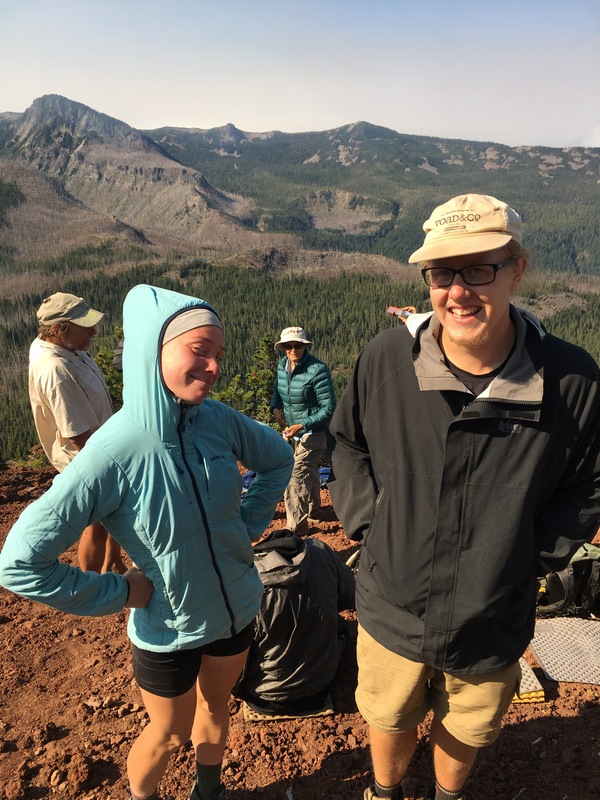 Bighorn and I often said we didn’t think we would deal with post trail depression. We have so much to look forward to after the trail, we just assumed we’d be distracted and excited and ready for stability. But now, with each passing day, I feel less and less ready for this experience to come to an end. 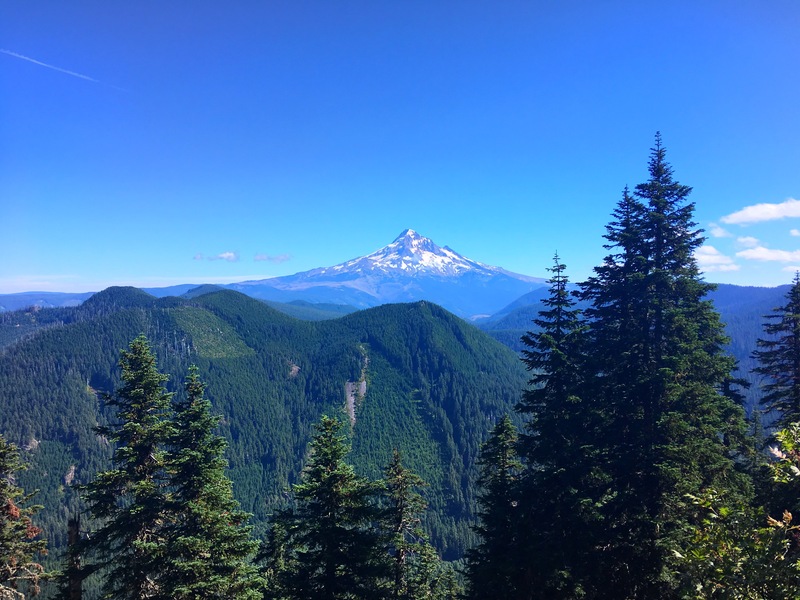 Oregon really helped solidify that feeling for me, condensing all of the great things about the trail and thru hiking into a short, two week period of time. It’s been bittersweet in so many ways. As for now, we’re crossing into Washington in a matter of hours, enjoying every minute that we can, and trying our hardest to not smell too bad. We’ll continue to update everyone as we can, and until then happy trails!